Here is the Foodarama Weekly Ad, valid Wednesday, April 17 – Tuesday, April 23, 2019. 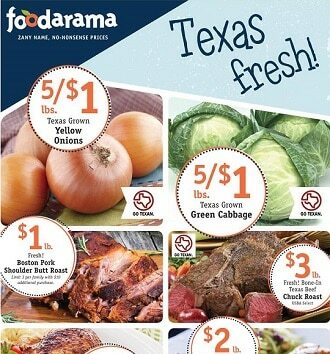 Don’t miss the Foodarama Ad specials for this week, digital coupons and grocery deals & Latino food promotions. Shop for super savings like Bone-In Beef Standing Prime Rib Roast, Chicken Whole Fryer, Garden Fresh Mustard or Collard Greens Bunch, All-Purpose Flour, Nestle Evaporated Milk, Oven Fresh Pie, Dressing Mix, Pork Sausage Roll, Quarter Sliced Meat, Smoked Sausage, El Mexicano Fresh Cheese, Freshly-Cut Sliced Color Bell Papers, Sweet Baby Carrots, and more.